EPW038540 ENGLAND (1932). The Lancashire County and Manchester Cricket Ground, the White City Stadium and Old Trafford Football Ground, Old Trafford, 1932. This image has been produced from a damaged negative. 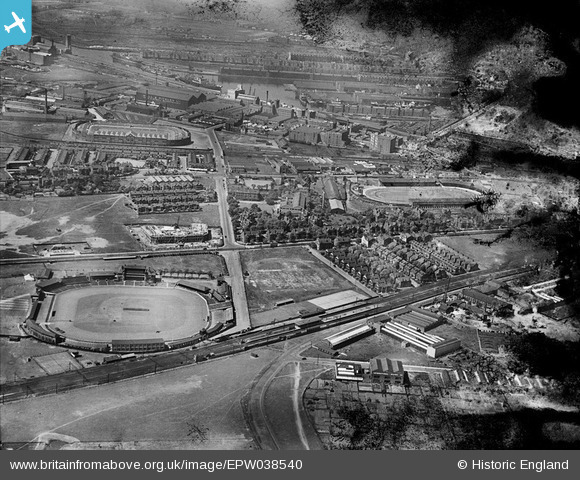 Title [EPW038540] The Lancashire County and Manchester Cricket Ground, the White City Stadium and Old Trafford Football Ground, Old Trafford, 1932. This image has been produced from a damaged negative. White House Farm site of,then Quicks for Ford, now Evans Halshaw Ford Dealers. Dog & Partridge Pub, bowling green to left. Remploy Workshops for the Blind. Stretford Town Hall under construction, Stretford became a chartered Borough in 1933 when construction was completed. It is now Trafford's Town Hall.